Prolight Concepts has released its Butterfly, the latest addition to the ACME range of lighting products, taking the recently popular retro-style sweeping beam effect a step further by providing mobile DJs with two rows of spots both able to move independently of one another. With an aesthetic reminiscent of old-school pinspot banks, mobile DJs will find the Butterfly ideal for retro-themed nights but also suitable as part of their modern lightshow due to its DMX-control and bright-white LEDs. The fixture features two multi-beam LED bars, each using four individually controllable light sources, to generate eight sharp long-throw beams. Backed by powerful 8W LEDs, each lens creates a narrow beam of light, and each of the bars curves through a 145-degree angle, giving mobile DJs the ability to fill a room or dance-floor with light. 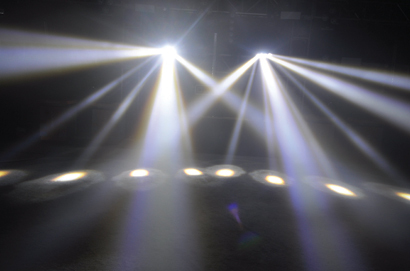 Two – or even more - Butterflys can be linked together in Master/Slave Mode or as part of a DMX-programmed lightshow, giving mobile DJs the option of having sixteen beams rather than eight, with four banks scanning in different directions. The powerful LED sources also ensure that the beams can cut through coloured lighting as well as smoke and fog for use as part of a more expansive show and the fixture also has pixel mapping capabilities, allowing users to create complex effects. In terms of DMX Control, ACME offers the user various different channel modes. The basic 1 channel mode allows remote selection of pre-programmed patterns, while the full 12 channel mode gives users individual control over each beam and the movement of each bar, as well as 0-100% dimming and variable speed strobing. A four-button LED menu system allows selection of the Master/Slave mode or standalone modes, as well as DMX address selection. For users who don’t want the hassle or complexity of DMX-addressing, but need more control than the standalone option gives them, ACME’s CA8 hand controller can be used. This allows users to select from the pre-programmed shows, activate a strobe effect and black out the unit when its effect is not required – all functions which are suited to the needs of mobile DJs working all-day or multi-faceted events. The Butterfly comes with heavy-duty Omega clamps that can be attached to the rear of the unit with quick-release fasteners and ACME has equipped the fixture with a safety loop, allowing the attachment of a safety chain or wire to keep the unit from falling if the clamp fails. The unit can also be mounted either horizontally – to create a cross-room right to left movement – or vertically – to create up and down tilting movements. DMX input and outputs are provided in the form of 3-pin XLR sockets, allowing mobile DJs to integrate the Butterfly into a larger programmed lightshow, or for multiple fixtures to be linked in a Master/Slave configuration. IEC connectivity also allows the user to daisy-chain the power supply of multiple units to save on cabling and therefore setup time. Look out for a full review of the ACME Butterfly from Prolight Concepts in Pro Mobile Issue 65 (May/June).